Dmanisi mandible. Georgia. Photo: Georgian National Museum. Evidence of toothpick use which was so extreme to cause a certain gum disease was found by scientists examining human remains from Dmanisi in the Republic of Georgia. The researchers analysed four mandibles from one of the biggest collections of well-preserved early human remnants known anywhere in the world.They used a new forensic approach to look at variations on the teeth of these hominids, thought by some to be early European ancestors. Teeth can shed light on what the individuals ate and how old they may have been, but until now it was not clear why there was so much diversity in the Georgian hominid mandibles, or jaws. “Progressive tooth wear triggers bone remodelling processes that substantially modify the shape of the jaw during an individual’s lifetime. 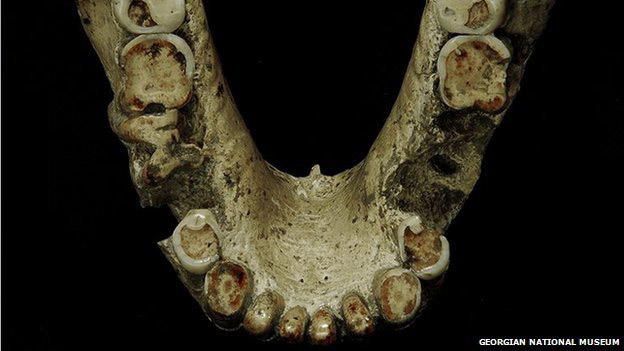 These effects are typically underestimated when attributing fossil hominid jaws to different species,” researcher Ani Margvelashvili told BBC News. “The individual who was using a toothpick was young, as his or her teeth were not worn down. We also discovered a damaged area between the tooth area and the gum. There was a small cylinder-shaped lesion – in this area, if you place a toothpick it goes through.”, she continues. It is still unclear what species the Dmanisi hominids were. Experts once believed it was Homo erectus who first ventured out of Africa. Still, the Dmanisi hominids were not typical of the tall-standing and big-brained H. erectus. Instead, they were short, long-armed, small-brained and thin browed. The fossils are therefore now sometimes referred to as Homo georgicus. Louise Humphrey from the Natural History Museum, London, said there had been a longstanding interest in the causes and implications of the high degree of variation in the Dmanisi mandibles and crania. Now, for the first time, having a group of four mandibles found in one site, researchers had the opportunity to see special features that have not been seen before and evaluate them in a more positive light. “Scientists often describe groups with new characters as different species. Here we show in one group you can see many characteristics. It shows once more how complicated the story of human evolution is,” Prof David Lordkipanidze of the Georgian National Museum (and co-author of the work), states.